It is very difficult not to look at this meme and burst out laughing immediately. Some brilliant meme genius has taken a photograph of a dog whose expression is the perfect representation of what a happily stoned canine would look like. The eyes are at half mast, the ears are sideways, and the smile is almost wider than the dog is. It’s the smile that really completes it. Surprisingly, the photo has not been visibly photoshopped – this comes from an actual photograph of two dogs on a boat in the water. The moment just happened to capture the dog looking right at the camera with all appearances of actually smiling. The original photo has been floating around the internet since 2006, and the original meme appeared on Reddit in 2010. This meme is so popular, it has its own Facebook page. The dog’s head is superimposed on a psychedelic colored background. All the sayings from the dog mimic exactly what stoned people would say. 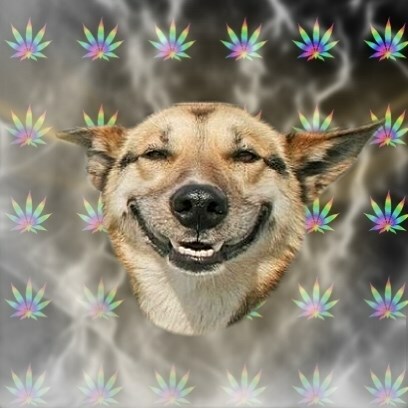 The marijuana leaves in the background indicate the type of drug that the dog is under the influence of, though the title “Stoner Dog” pretty much gives it away. Notable quotes from Stoner Dog include “If you say Jesus backwards … It sounds like sausage”, and “Where is my lighter? Oh nevermind, it was in my hand”. desde cuando eres verde ?